Did you know that Tungsten does not come from normal stars? The heaviest element that comes from fusion reactions deep in stars is Iron. All the heavier metals like Tungsten, Gold, Platinum and a few more must come from the explosion of a supernova star. Over 2 oz pure (99.95%) tungsten bar 1/4″x 1/2″x 1.5″. Pro racers know the importance of getting the most weight behind the back axle. 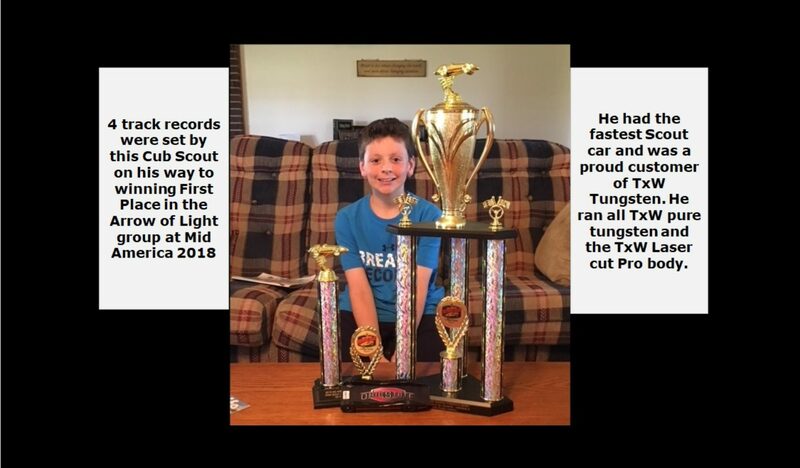 That is why four present world record holding Pro racers run cars with TxW Bars in them. This bar is made of 99.95% tungsten, and weighs around 2 grams more than the common 12 cubes made from a lower cost alloy of tungsten. Pro racers use this bar to gain a speed advantage over the competition still using the cubes. 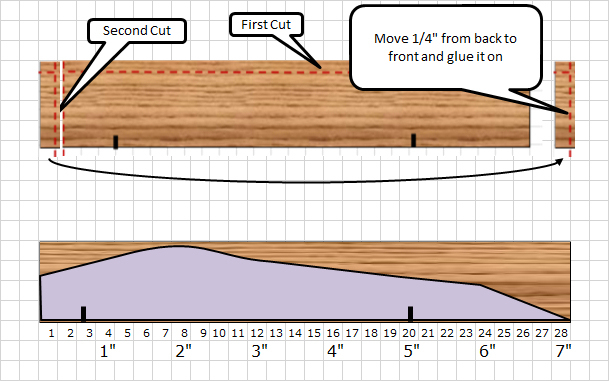 Cub racers looking for an edge can cut a simple notch in the back of their car 1/2″ wide and 1/4″ deep and 1.75″ long across the back ( see photo) even if all you have for tools is a hacksaw. If you do NOT have a way of cutting this notch, this product is not for you. 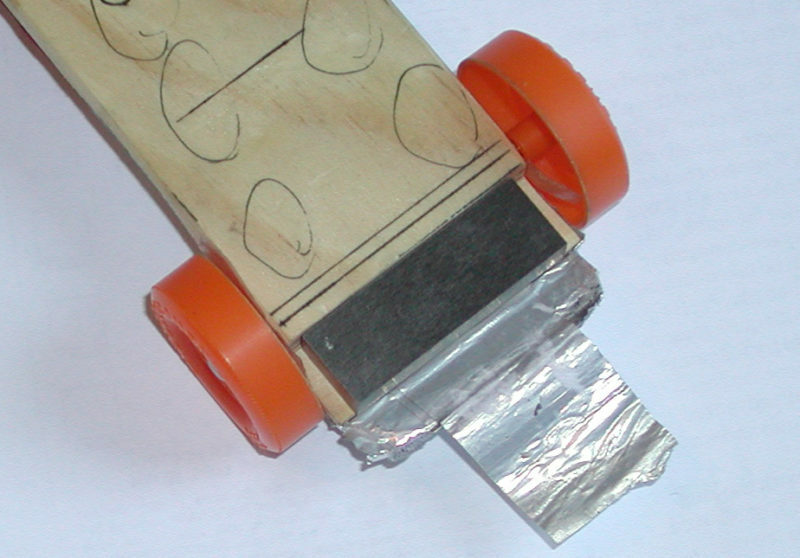 It will not work to tape this to the bottom of your car without a recess, it will drag on the track and will be slow. If you do cut a notch, You will now have a much faster car than what you built without this weight. 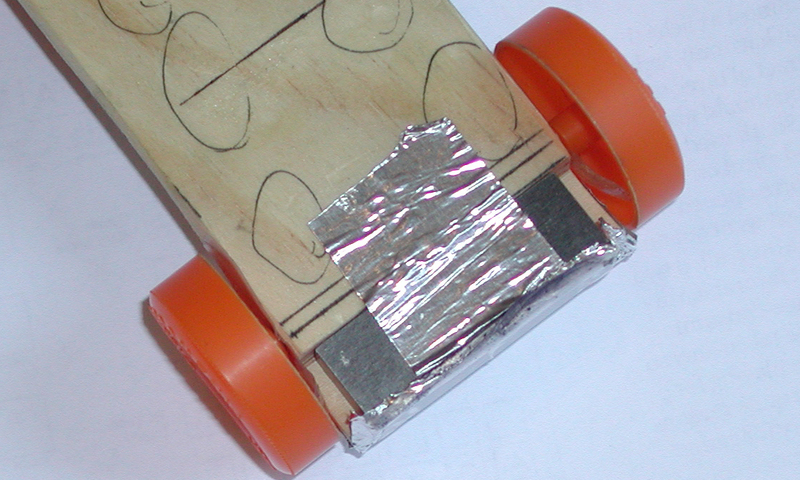 Use metal tape, epoxy, or TxChemist Super Tape to secure bar to body of car. We used our test car that needs 3.715 oz. of weight to bring it up to 5 oz. Test 1 was with TxW 99.95% bar put in the notch behind the back axle. We added 3.25 oz. of tungsten plates to bring it up to 5 oz. We ran it and took the average speed on a metal track. Test 2 We then replaced the Bar with the lower weight cubes, and had to add another 0.25 of tungsten plates to bring up the weight. The center of gravity was not as good as when the car ran with the Bar. We recorded that average speed. 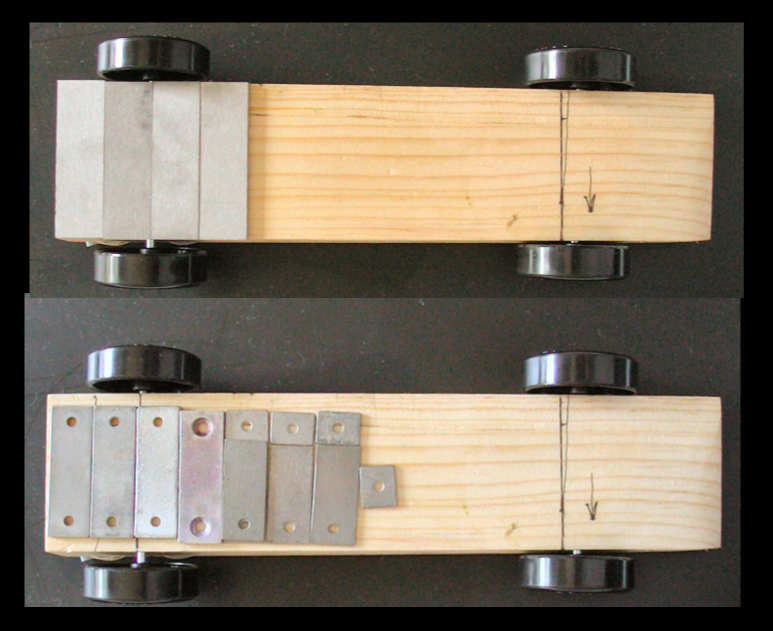 If the cars were in the same race, the car with the TxW Bar would win almost every time. The photo above is to show where you place the pure tungsten plates. BUT- this car will drag on the track unless you adjust it as shown in the design help area. All stick on and screw on weights are not the same. The Density of the alloy and the size of the plate will obviously contribute to plates with different weights. The present tungsten plates all run around 0.5 oz. and are close to the same dimensions. These dimensions do not take advantage of all the space available on the bottom of the car. The Zinc and Steel plates are so light they can not compete with real tungsten plates for speed. When you are limited on tools and need to just put plates on the bottom of the car, you quickly will see how inefficient it is to use undersized plates or low density plates to control the center of gravity. 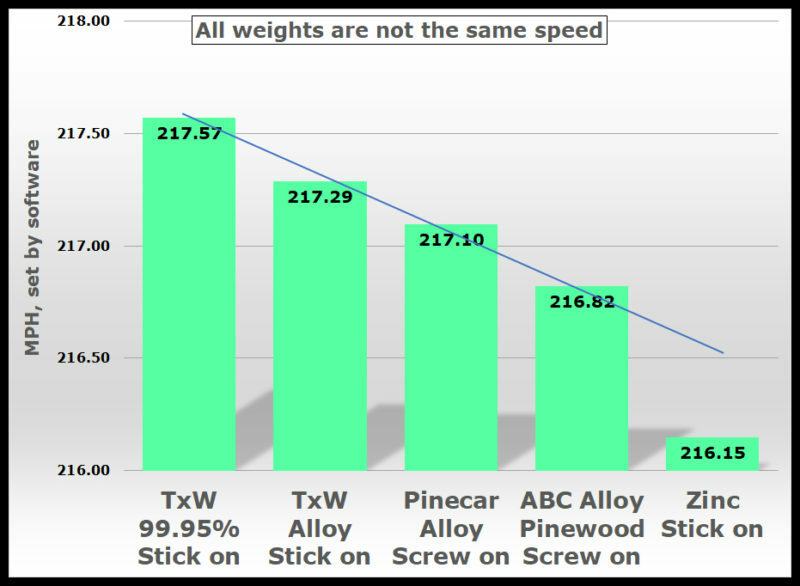 Let’s look at what differences there are between an ordinary tungsten alloy plate and the new 99.95% W plate from TxW. First we have the size. 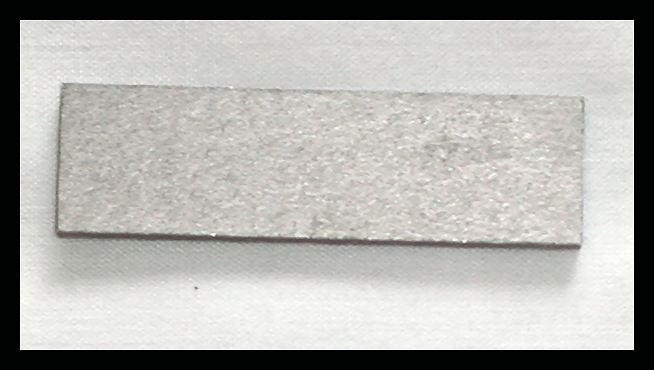 A solid 99.95% pure tungsten plate 2.4 mm * 12.7 mm * 43.5 mm or in inches-0.095″x 0.5″x 1.718″. Engineered to cover the full length of the pinewood body and allow two plates to be places behind the back axle on standard wheelbase cars. If you want a fast car, you must put the biggest engine available behind the back axle. 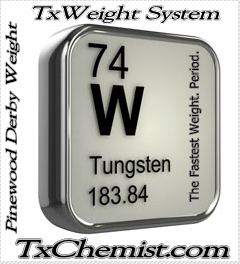 That means pure 99.95% tungsten from TxChemist. Bigger engine, better center of gravity, higher speed. You can go overboard with too much weight if you use the standard axle spacing, so unless you are an experienced rail runner, or have a test track, stay on the plus side of 1/2″ in front of the back axle for your Center of Gravity. 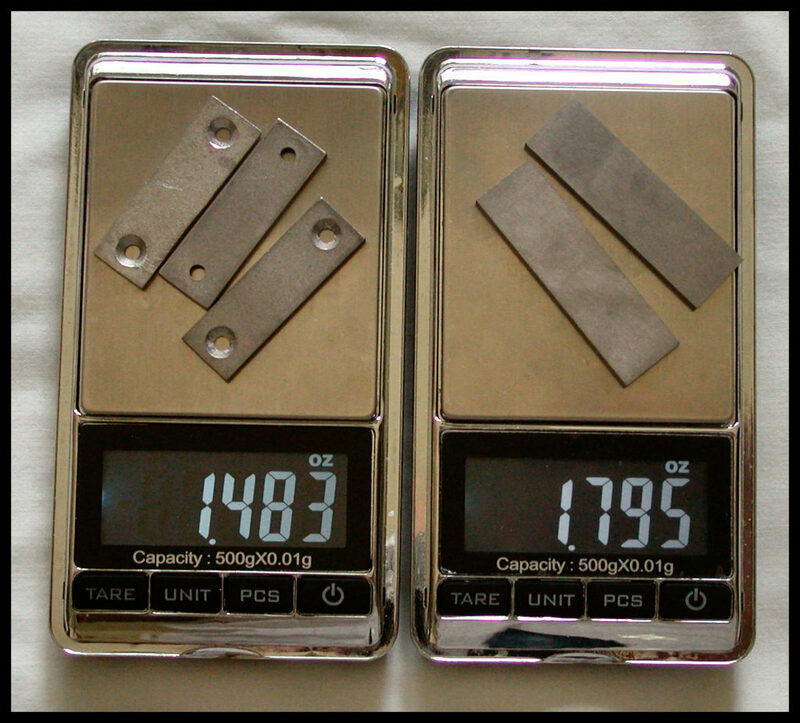 Here we compare size to an ordinary alloy plate. So the TxW plate is longer, wider than some vendors, less wide than others, and thicker than all. It also is denser. How much denser depends on what alloy the vendor of the ordinary plates uses. 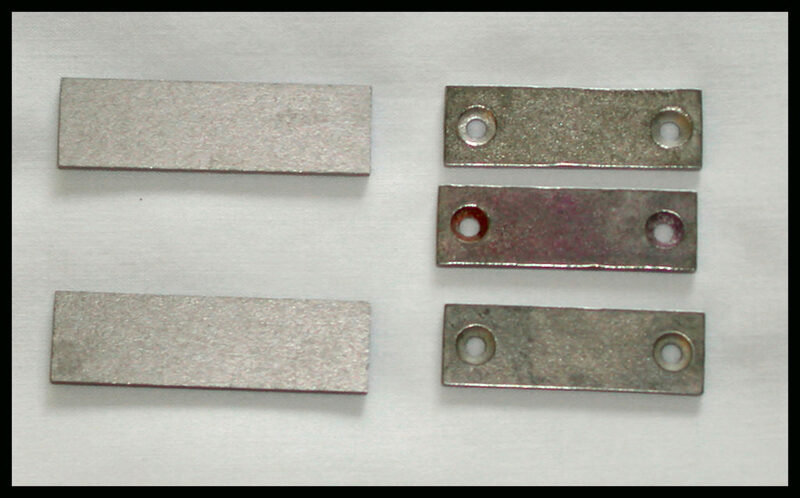 Whatever alloy is used will not be as dense as pure tungsten plate. So is there a weight difference? Yes, quite a bit. 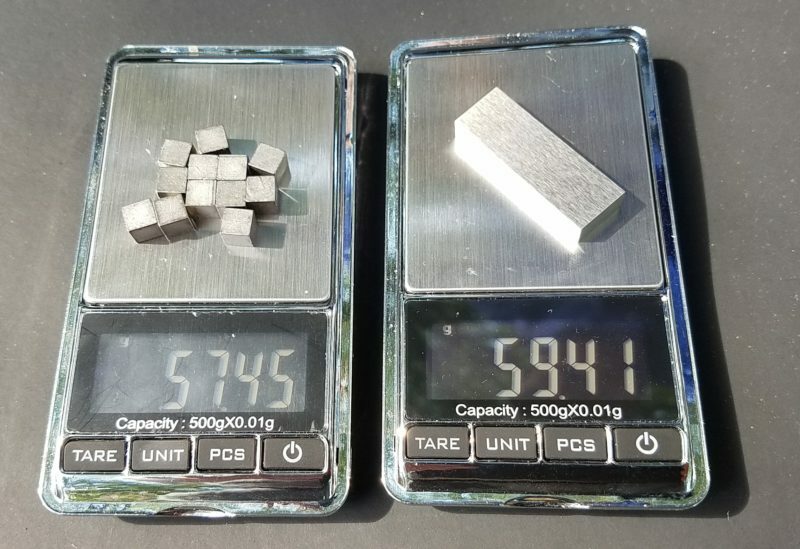 Two plates of the new TxW tungsten weigh substantially more than 3 plates of ordinary tungsten. Why does this matter? Let’s take a real life problem and look at it. Suppose you are ready to add weights to your car and the total weight of the wood and wheels etc. is 1.41 oz. So 5 oz. minus 1.41 oz. equal 3.59 oz. of weights need to be securely fixed to the bottom of your car. You go online and find one vendor selling individual 0.5 plates for only $2.95 ea. That looks like a bargain, but the shipping is $4.87. That still looks OK because you can bundle up other things with that shipment for no additional charge. So we need to buy 7*0.5 oz.=3.5 oz. plus some tungsten putty we have around that we will not use in the calculation. So 7*$2.95 + $4.87 = $25.52. That is a lot of money, but tungsten is expensive and you will not get a better center of gravity with any other material. Let’s look at the most popular tungsten plates sold as a kit. Wow, sometimes a toy store has a lot of inventory and dumps a few on the market. Then you see many for sale all very close together, and then a few at really high prices trying to get someone not paying attention. The only way to do this comparison is to stick with the MSRP and the typical shipping charge. We have 2 oz. kits running about $16, and we have a 3 oz. kit running about $19. So you might go for the “good” deal, but where will you get the other plates to get up to 3.59 oz. ? You were better off getting two 2 oz. kits so you would have enough plates. Cost will run you $32 to $34 and you will have a few left over for next year. You also find the new TxW massive pure tungsten plates that weigh over 0.84 oz. and up to 0.9 oz. We now have a test car shown with both TxW 99.95% plates and the same car with ordinary tungsten plates In both cases we added weights of 3.59 oz. to bring the car up to 5 oz. You can tell by eye that the center of gravity is way better with the heavy pure tungsten weights. When the car was run on an Aluminum test track, we recorded the speeds for both weights. It was an astounding 1/2 MPH faster for the TxW system. It was almost a full MPH faster than another vendor. To summarize, Why buy the slower, more expensive ordinary tungsten alloy when the faster, lower cost pure tungsten plate is now available? 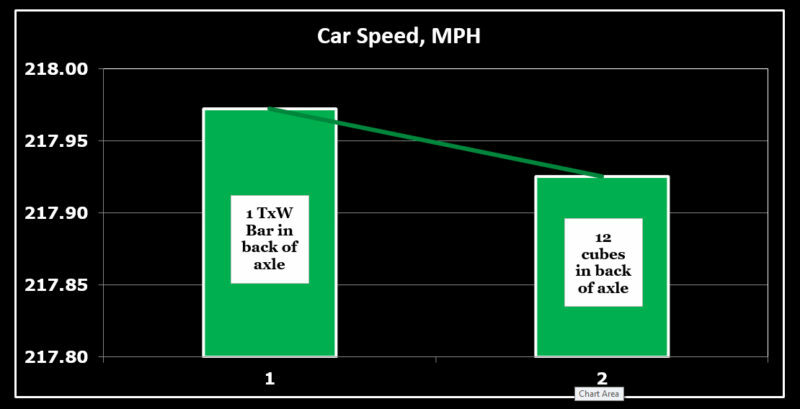 See below for the improvement in speed on the same car the TxW weights made. We then tried the stick on Zinc ( which is even lighter than Zinc because they add Aluminum to it.) That is super slow because you can not move the center of gravity back very far at all. Then we tested a new TxW High % W Alloy. The finished data is shown below. 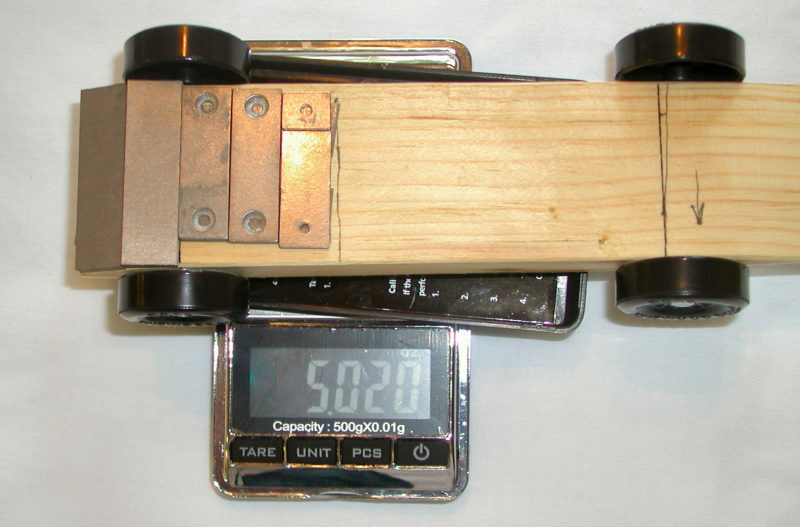 Estimate weights needed for your car. 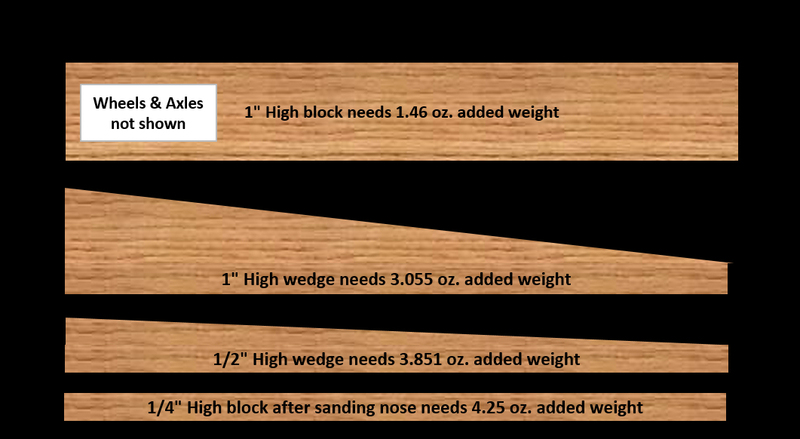 Based on typical Ponderosa Pine, we estimate the weights you will need if you make a car in a typical wedge shape. You can see that with a 1/2″ high car, you will need over 3.5 oz. of added weight. That is why we recommend you get 4 oz. of good quality weights and go for a fast car. Yes the lower profile car will generally be faster. 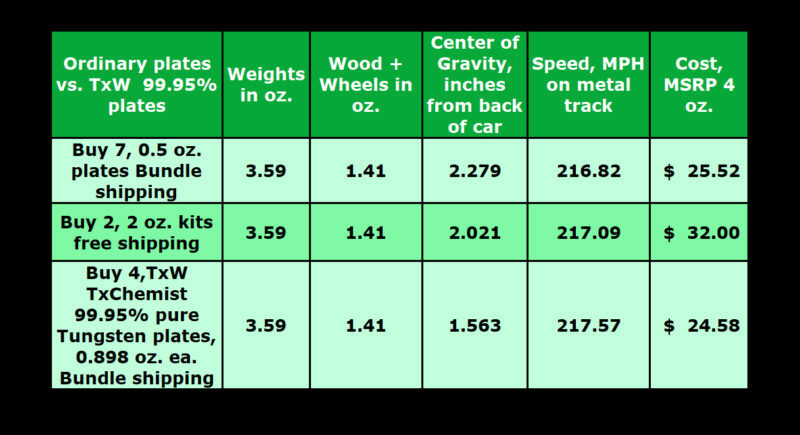 Wind resistance IS a factor, and when you add the weight to bring the car back to 5 oz., if you use the correct weights you can significantly change the Center of Gravity and the speed of your car. The photo above shows two important things to consider when you use weights on the bottom of the car. The back right rear wheel has been removed to show how the weights will now clear the track. The red rectangle shows what would drag if you did not sand the back of the car down. put the axle holes down close to the bottom of the car. If you can not do that very well, then cut or sand off the bottom to make the axle holes close to the bottom. If you have to keep the back axle about 1″ from the back (NOT very common, read those rules again. Are you sure you can not remove some wood and then glue it back on? OK, for some reason you are keeping the out of the box axle location from the back of the car. 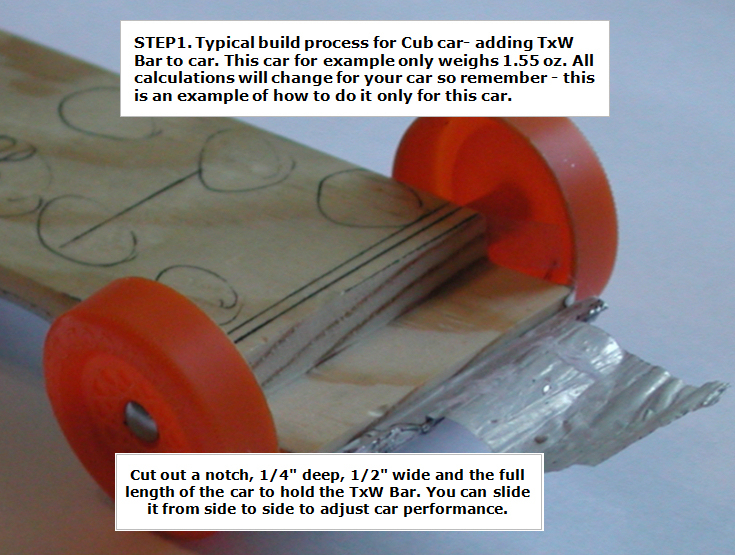 Then you must sand or cut a bit of wood off the back of the car at an angle to allow the first weight to be placed where it will not rub on the track in the curve. 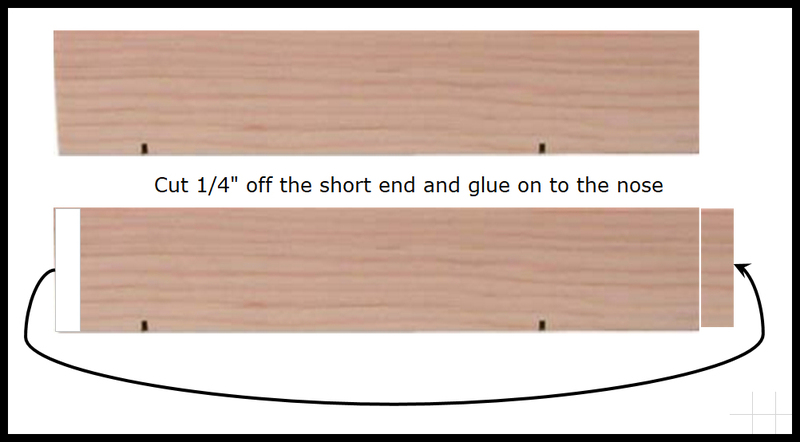 Remove the last 1/2″ to make a trangle 1/4″x1/2″ on the sides. 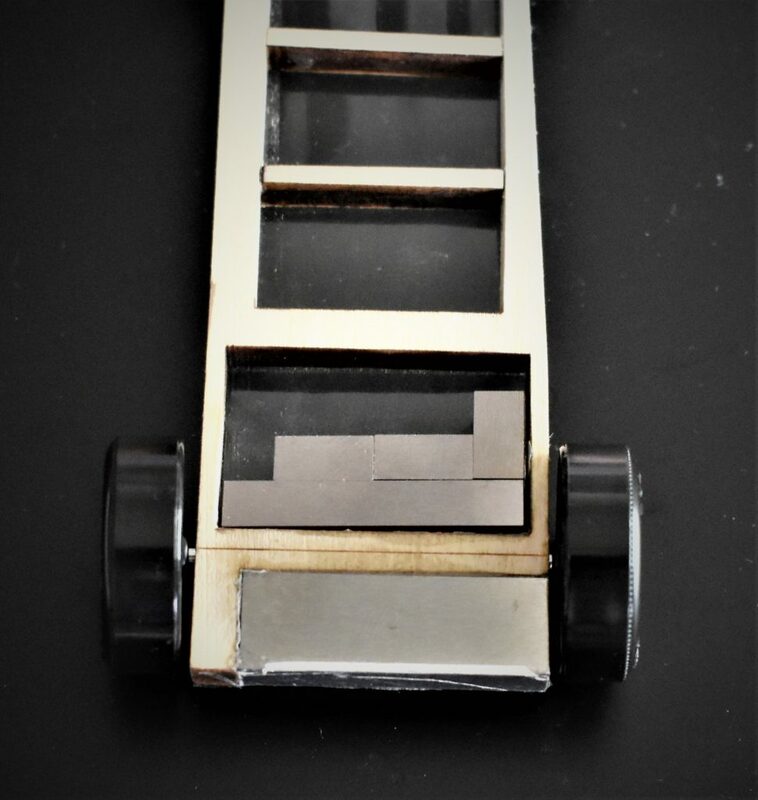 The first thing to consider about your car design is this question- Can I move the back axle back 1/4″ closer to the back of the car? Read the rules over many times. Here is an example that is confusing. OK, here are two cars, do they both meet the rules? Am I allowed to remove any wood from my car? If I want to, can I glue some wood back on my car to make it a full 7″ long? If the answer is yes to both these questions, you can move the wood from the back of the car to the front. 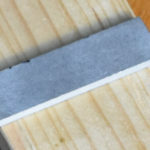 If you have a saw, you can make your job easier by cutting the block down close to the final height and cutting 1/4″ off the back and gluing to the front. The car above has a number of problems. If you really want good speed, it is still to high. You also want to move that nose up 1/4″ so the car will not have lift up or down and that gives the least drag. Now when the axle is close to the back of the car, there is little danger of a weight rubbing. But it can happen with a 1″ distance to the back axle as the car goes through the curve..
You will have a much faster car if you never drag anything on the track. You can also increase speed by reducing drag at the nose by lifting the nose by 1/4″ from flat. You also get faster if you remove wood and make a lower profile (shown in purple compared to the yellow starting design. The last thing to think about is if you have to keep that back axle near 1″ away from the back of the car, it might drag on the track so remove the blue area shown below to make room for a bottom plate that will not rub on the track. 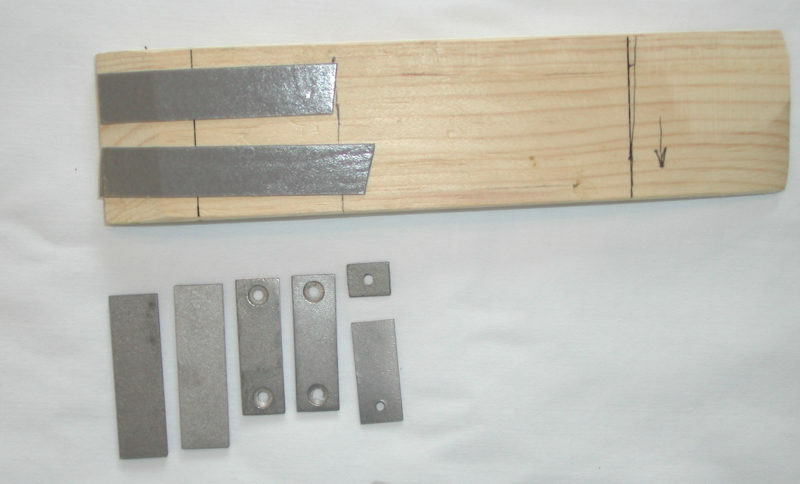 This can be cut off or sanded without much work and makes a big difference in your speed. The drawing below shows the curve of a typical Aluminum track in blue, and the 1/2″ high rails in red. The light blue zone is what you should sand off to allow a weight on the bottom that will not rub on the track.